Hi GE - Hope you and family are well. Sorry you couldn't make the trip to hubs eye doctor due to ice storms. Thanks for posting JSM and CC's wedding pic's. JSM's pic (praying hands) depict so accurately the importance and devoutness she has always placed in marriage in her church, imo. Bless her heart and CC's for his understanding. He was happy to cancel believe me. Can't say I blame him since he gets a shot in his eye. OUCH !!!!!! You're welcome for the pictures of CC & JSM. They are wonderful people. Wish Babs & I could get up to see them more. We had our last round yesterday. Icy rain again then snow. It was cold. But today the sun is out and hopefully we are done with the cold. Hope this is your last blast too. You all are always so sweet, supportive and caring of each other! I saw the wedding pics of JSM and cc on face book. It was lovely. Glad they got to have their special day...they are great together. I do have a knee scooter coming - it was supposed to be here yesterday but got delayed until tomarrow. Right now I am on crutches and not leaving the house! I am not very coordinated on them but I can get to the bathroom! Never heard of a "knee scooter" before. Looked them up. Neat! Glad you will have one to use. Are you in a cast or a boot? Either way, I am sure the knee scooter will be a great help to you. Right now I am in a splint to allow for swelling. In two weeks I go back and get stiches out and either a cast or a boot. Depends on how the healing is doing. Hope you have a speedy recovery. Take care of yourself so you will heal! JSM and CC looked great together. They must have a good friendship, very contented, looking couple. I miss reading their posts. Did they do the Hokey-Pokey at the wedding? Happy belated, Valentines Day, Cookie, I read your thoughtful greeting. Did you know that birds can not digest milk? I make cornbread with water instead of milk. Hi Seahorse...hope all is good for you and yours! It's been "Chili" in the N.E. I am going to Chili, and dunk cornbread in the dish, sounds sooo..good. Daylight Savings Time tonight or tomorrow. TBM How are you doing? Did you get your scooter? Continued prayers for a fast recovery. Hope you aren't in a lot of pain? Brandi, How's your weather? We had a couple days of sunshine and now back to cloudy & rain. How's Panda doing? Sister, Prayers for you all. Getting any where with SS for your sister? Can, Hoping you and your family are all staying warm & safe. Caddy Miss hearing about your fur babies. Cookie Hope to see you check in more. Sounds like you are enjoying your retirement. We finally had a beautiful day yesterday and I hear birds singing. I am doing ok. Scooter is coming today. May try to get out of the house today!!! Yipee! Sorry I've been AWOL for so long. Missed everyone. Give my best wishes to CC and JSM and congrats. I got the flu and it affected my throat..big hassle but all is back to normal....vocal cords all healed and I can talk again. For the last 4 weeks Hobbs has been in a sling in the barn. The vets are still trying to find the cause of his condition. I found him down one morning and he couldn't get up. Thankfully I had the equipment from Lumpy to sling him. It took six men to lift him into an upright position. The sling is attached to an engine lift and when we let him stand on his own if he starts to go down we can lift him back up to a standing position. I do this 3 times a day trying to keep his muscles in shape. 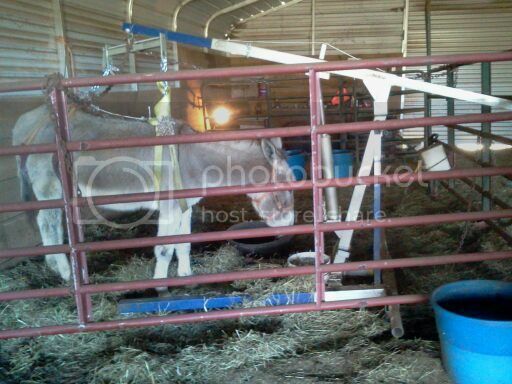 He is not a good patient...he kicks the side of the stall and tries to bite the other donks through the corralling. He is frustrated because the donks go out to the pasture and he can't go so he gets outrageous. Including a picture of his pitiful self. TBM fingers crossed the foot heals quickly or Hobbs will have to share his equipment with you. 4Donks - I could use that! Stairs are not my best thing with two legs and to get out of the house I have several. I got out yesterday and coming back in fell. Did not hurt the ankle but did scare the heck out of little man! So I am trapped until I can figure out a better way! Good to see you, too, Thank-you. May I ask, did you attend CC's wedding? Did anyone do the Hokey-Pokey? The marriage photo was beautiful so thoughtful to post it. Yes Babs & I went to the CC's & JSMs wedding. It was lovely and sweet at the same time. But sad say no there no Hokey Pokey done. 4Donks so Happy to hear from you. But sorry to hear you have been ill lost your voice again. And that sweet Hobb's having health problems. Prayers he improves soon. So he can go outside and play with his pals. How are all the other fur babies doing?